Easter will be here before you know it, so I thought it best to get in early with the Easter recipes. 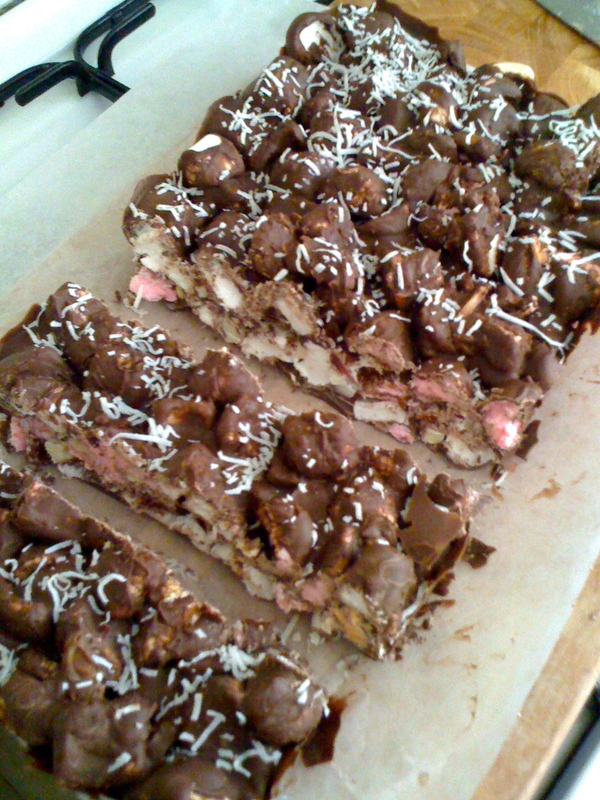 The first recipe is of course, a rocky road one. 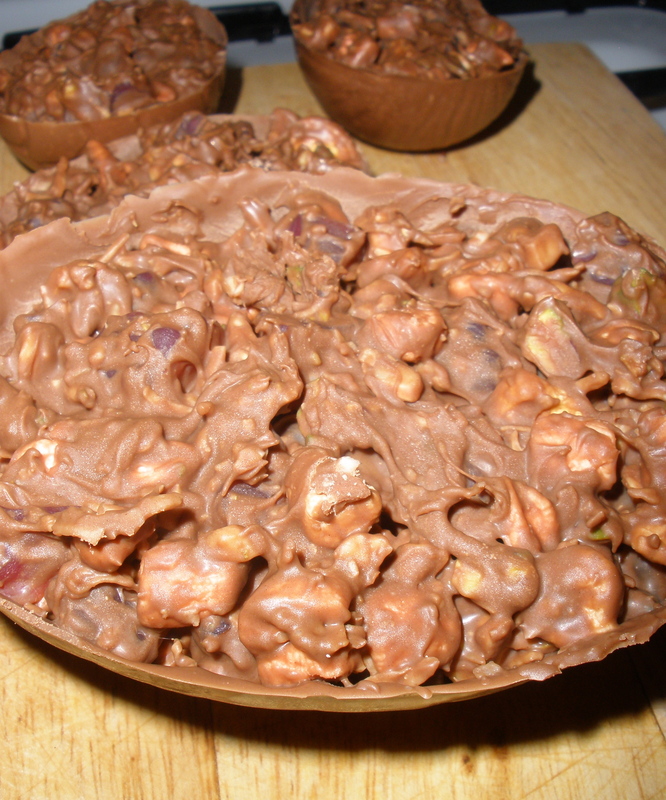 I almost decided to not to post it this year, as I know I’ve posted a few rocky road variations already, but I think this is a great gift for Easter. The recipe below is enough to make 8 medium-sized eggs, but I made 1 giant and 4 medium eggs instead. If you do choose to make a larger egg, allow more time for the egg to set in the fridge. Also, this post constitutes my entry into Kitchen Wench’s competition to win a Cuisinart Ice Cream Maker. Imagine the things I could make with that! 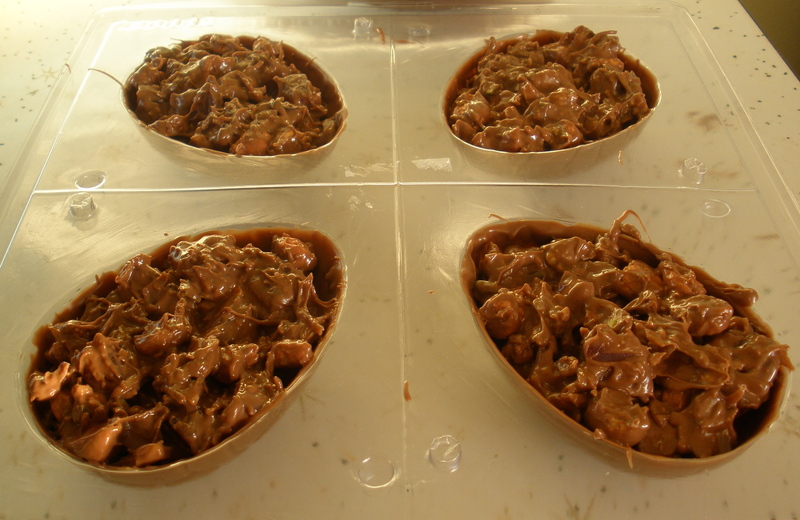 Using a small pastry brush, coat 8 holes of an 8cmx6cm (1/4 cup-capacity) egg-shaped moulds with melted chocolate. 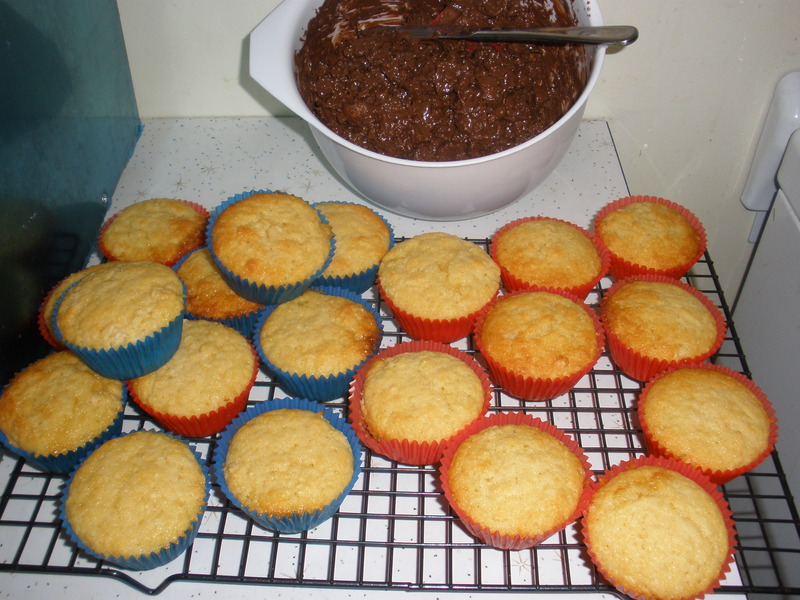 Refrigerate moulds for 20 minutes or until set. 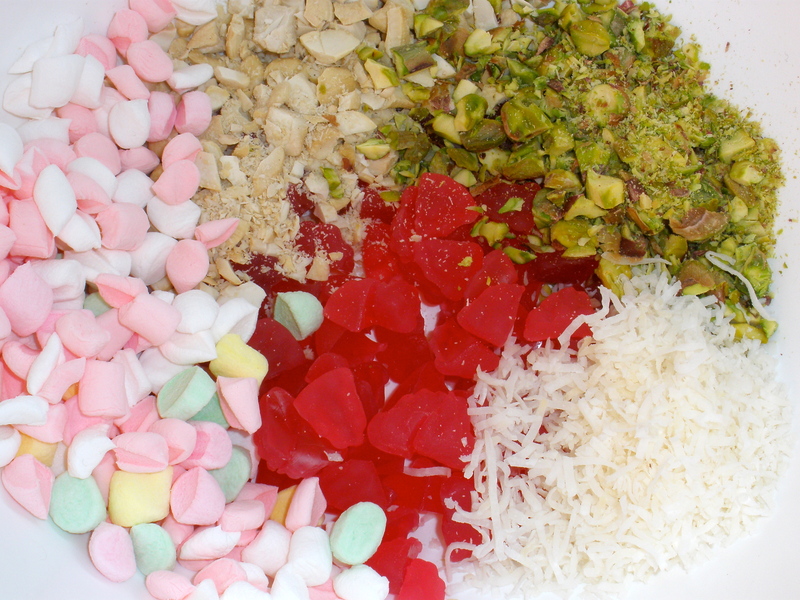 Combine raspberries, pistachios, cashews, marshmallows, coconut and melted chocolate in a bowl. Spoon mixture into moulds, pressing lightly with the back of a spoon. Very carefully remove eggs from moulds. 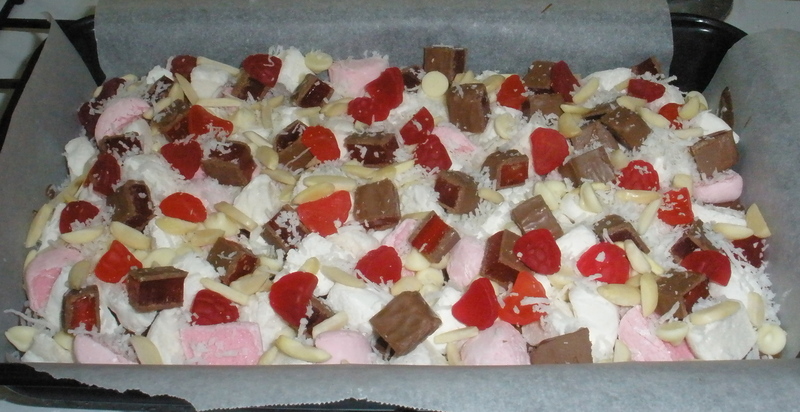 Here is the other successful recipe from a Christmas gone by, Raspberry Rocky Road. I love rocky road but just hate glace cherries and I much prefer to use raspberry lollies. There are plenty of rocky road recipes – and they’re all easily adaptable – but I like this one in particular because it makes a nice big slab of rocky road, which makes for an attractive and decadent gift item. My brother always requests this and so I sometimes make some just for him. Line base and sides of 26x16cm lamington pan with baking paper. Melt 300g milk chocolate in microwave, stirring often, until it’s smooth. Pour into the base of the prepared pan. Arrange half of the marshmallows over the top. Next scatter over the white choc chips, turkish delight, raspberry lollies, half the almonds and half the coconut, filling in any gaps. Scatter over the remaining marshmallows. 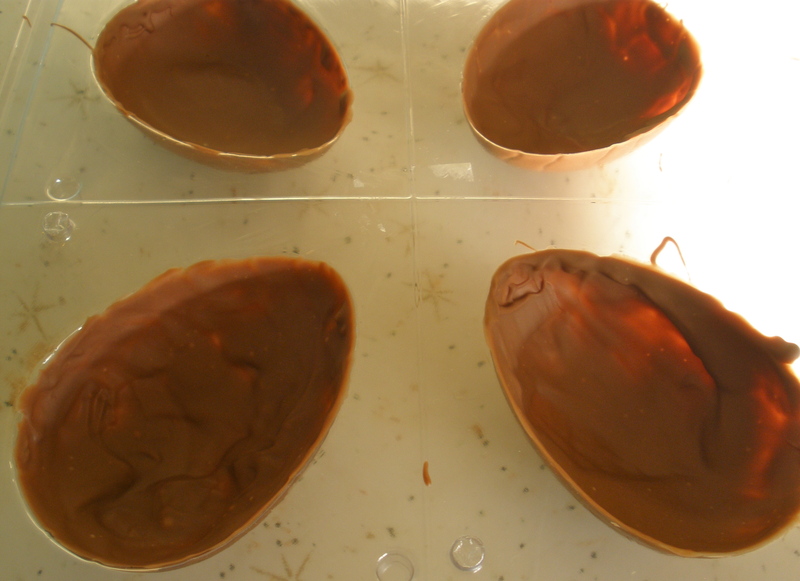 Melt remaining milk chocolate in the microwave, stirring often, until it’s smooth. Pour over two thirds of the melted chocolate, covering the marshmallows evenly. 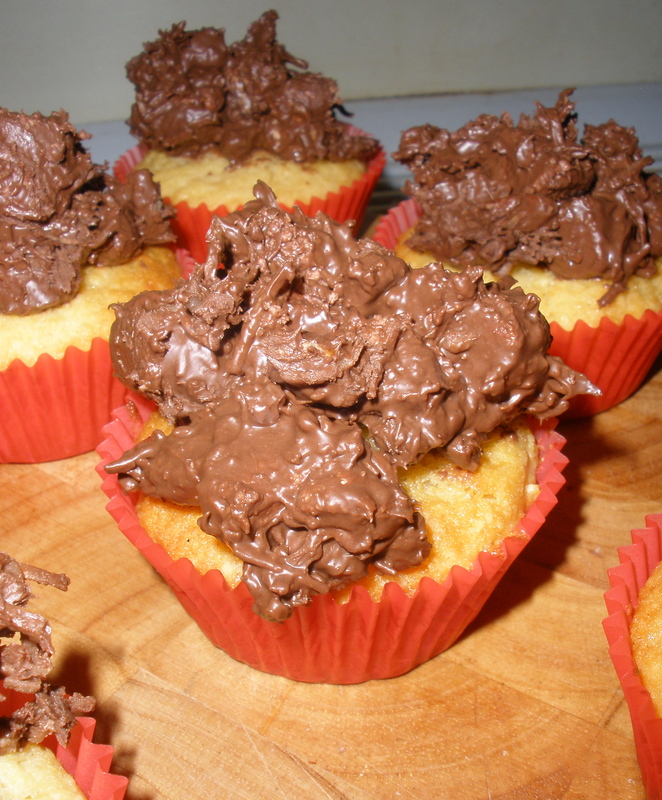 Use a small spatula to gently mix and allow chocolate through the layers. 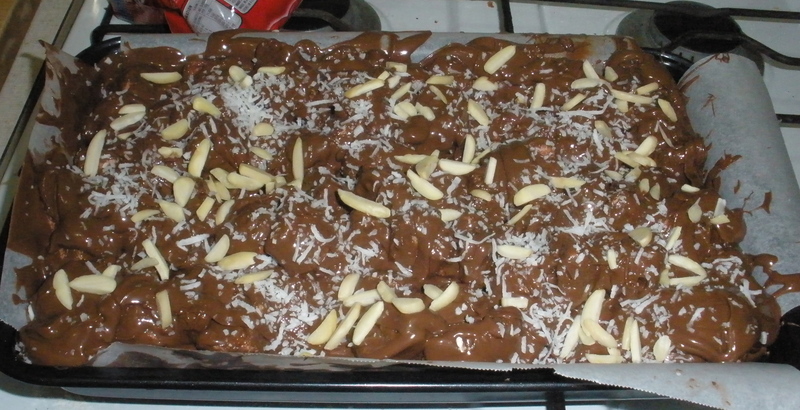 Scatter with the remaining almonds and coconut, pressing down gently to stick to chocolate. Chill for at least 2 hours to set. These cookie sandwiches are best served with a mug of creamy hot chocolate. 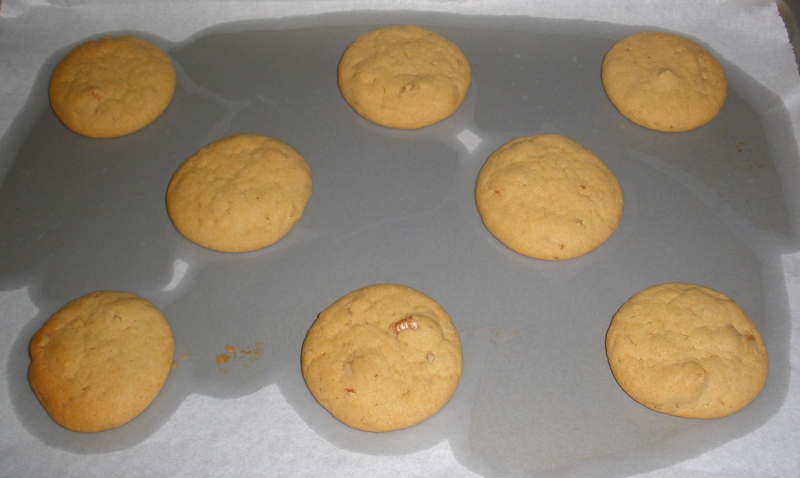 Straight after baking, the pecan cookies are quite crunchy, but by the next day they soften to a slight chewiness. When toasting the marshmallows under the grill, be sure to keep an eye on them, as you want the mini marshmallows to soften and brown just a little. 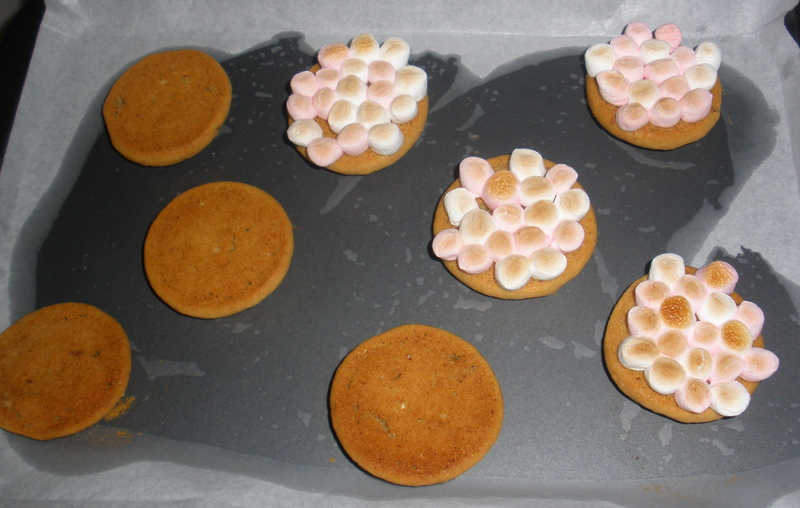 If they brown too much the marshmallow will taste unpleasantly burnt. Preheat oven to 170C. Line 2 baking trays with baking paper. Using an electric mixer, beat the butter and sugar in a large bowl until pale and creamy. Add vanilla and egg and beat until well combined. With a spatula, fold combined in sifted flours until just combined. Add pecans and fold in until combined. Roll level tablespoonfuls of the mixture into balls. Place 4cm apart on a prepared tray. Press to flatten slightly. Bake for 12 minutes, or until lightly browned. Remove from the oven. 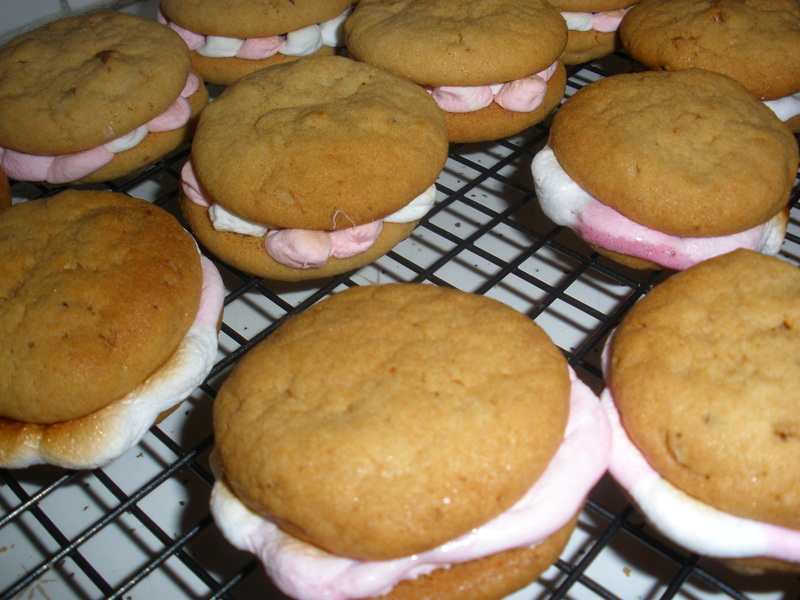 Turn half the cookies over and top with 12 or so marshmallows. Put cookies under a medium grill for 3 – 5 minutes, until softened. Top with remaining cookies and press gently together. Set aside to cool.